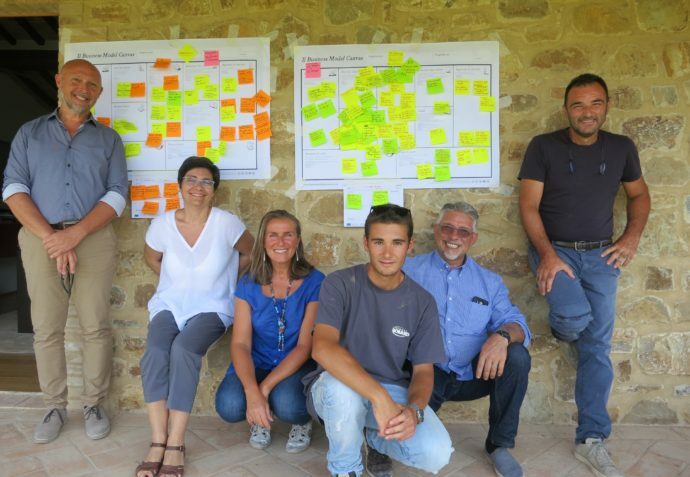 Within the SPARKLE project, the GESAAF (dipartimento di Gestione dei Sistemi Agrari, Alimentari e Forestali) department of the University of Florence, with the active contribution of Agrismart Lab, is conducting different tasks, like work analysis and planning of a new business model (BM) approach for farms. During this step, the support of the consultants of Euroteam Project has been strategic, indeed they conducted a micro-workshop about business model analysis, using the Business Model Canvas. We asked two entrepreneurs to represent the state-of-the-art of their company: Giancarlo Pacenti, wine producer of the famous wine Brunello di Montalcino and Marco Antoni, CEO at Copernico, an advanced service company for agriculture. Hence, we had the point of view of a company which promotes and disseminates precision agriculture (PA) services and the other company, which is already using PA technologies. Although it was their first time, the two entrepreneurs felt comfortable with the Canvas tool, intuitive and easy to use. The analysis process was very intense, ideas and concepts came in quick succession and they influenced each other with their own advices. Once the two different business models have been drafted out, Mr. Pacenti and Mr. Antoni was asked to describe the PA impact on their BM and it was possible to observe how PA fits in all areas constituting the Canvas model. While talking with the farm’s owner, Mr. Pacenti, it became clear the incentive which persuaded him to invest in precision agriculture: to reach a quality level much higher than the current one and to prepare the agriculture of the future in the medium/long term. The incentive for costs reduction for viticulture of excellence seemed less important, also because, in this step, costs are not less significant, but basically higher. The Canvas tool started a rich debate on the meaning and value of the introduction of PA, namely the possibility to organize and making available and useful the data collected through new technologies, in order to realize a personalized treatment of the farm even in broader contexts. But… how was SPARKLE financed?